Here I share my customized Visual-Studio 2015 (VS-2015) dark-theme coloring scheme that works with Visual F# Power Tools (VFPT). The selection of colors for syntax highlighting is nearly as tricky as finding good names for functions and values. And it depends on personal taste. The F# language specific syntax elements are defined in darker color. That allows to better focus on the domain during code reading and writing. 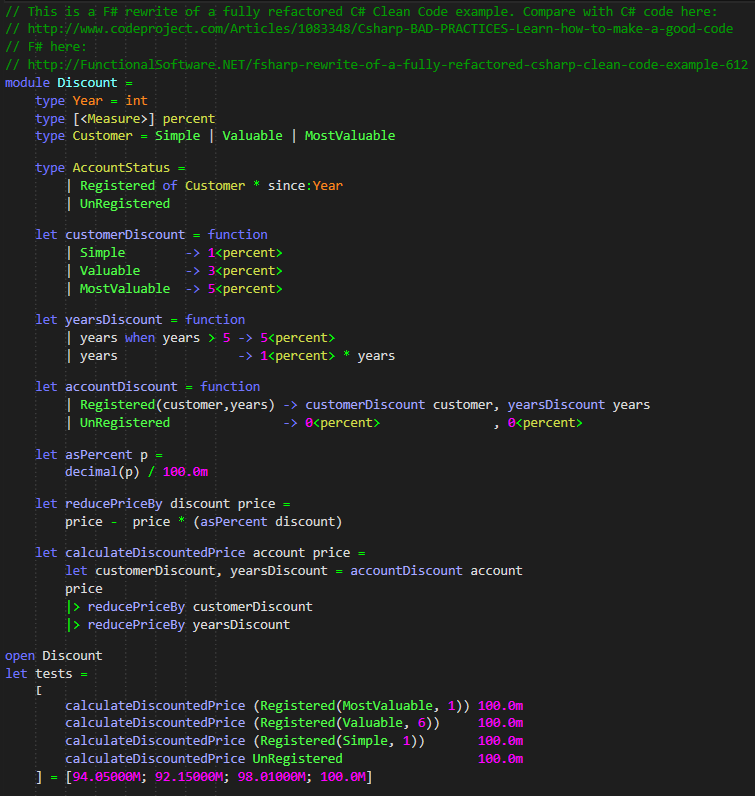 This is an example of F# code highlighted with this coloring scheme. The screenshot shows the VS-2015 Options dialog where F# Mutable Variables and Reference Cells are defined in red as a warning (which is good default). 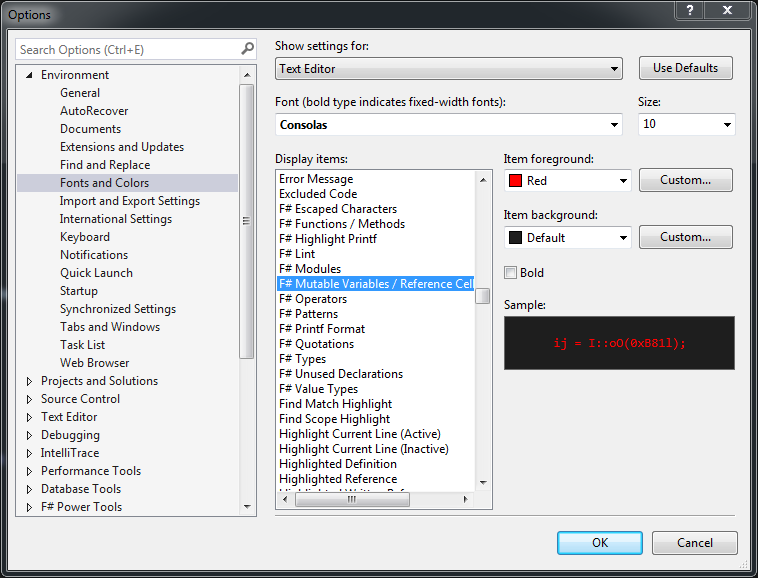 Note that by default not all F# Display items are defined in a stand out color. Note that the Visual F# Power Tools (VFPT) must be installed first. 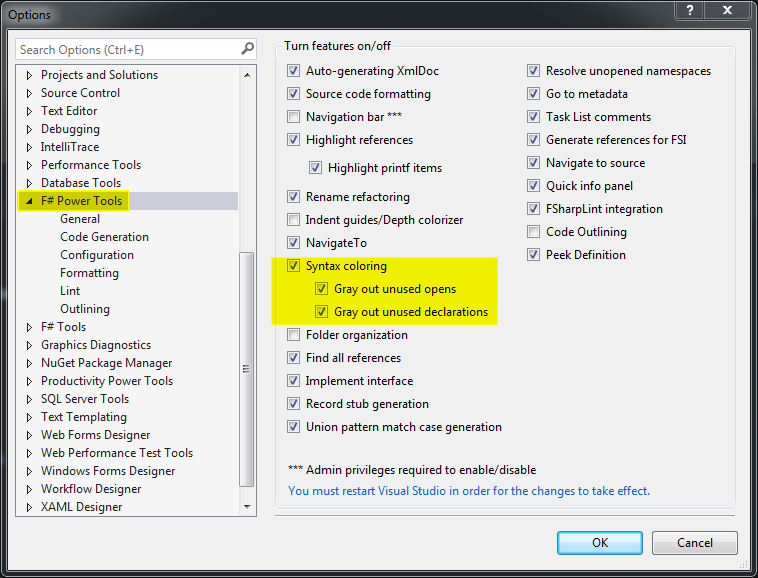 Note that in VS > Tools > Options > F# Power Tools the Syntax coloring is activated. Note: don’t forget to make a backup of your Visual Studio settings before importing and changing settings. Here is an zipped export (*.vssettings) of the VS-2015-FSharp-Font-and-Colors-Exported-and-pretty-printed-XML containing only font and colors. And the big thank you goes to the F# community for this excellent tool which is open source.